It's been a busy summer, despite the hiatus. The latest Economic Report numbers were particularly weak, and I was considering skipping the month. But MarketsForISK has been publishing some serious articles and Delonewolf over at EVE Talk posted a review. Though my fellow pundits took some serious dives into the data, I'd like to counterpoint with a more brisk review. Be sure to check them out if you want more depth, but let's take a more general look at the stats. 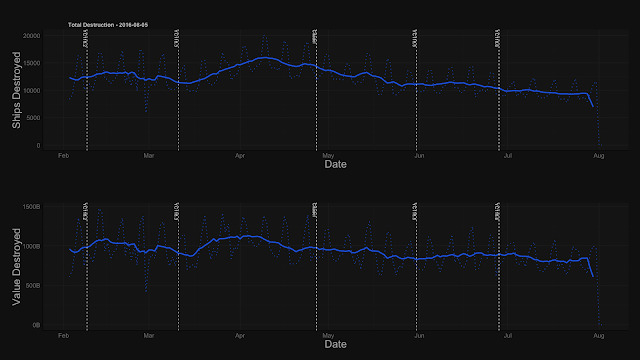 Ohboy, though last month's review was largely positive, thanks to "better than expected" activity metrics from the Serpentis event, July crashed down hard. The month-to-month sinks and faucets chart was particularly troubling. Though specific ISK sink/faucet numbers are in-line with the expected baseline, the Active ISK Delta (money leaving through inactive accounts) is worrying. June's retraction was expected (WWB + Citadel) but July keeping up the trend is what concerns me. 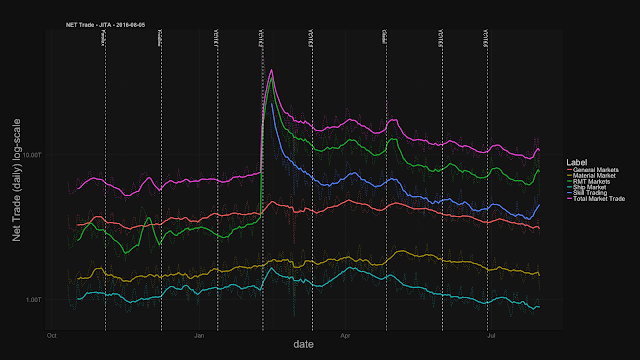 Pair this with my favorite stat, ISK Velocity, and we're seeing a much harder retraction than I originally expected. With the latest Blog Banter stirring the EVE Is Dying pot, these numbers could validate those looking to catastrophize. I would not be so hasty to eulogize though. I don't think the numbers are all bad. Looking at the net-trade and PVP stats, things are still pretty positive. Are they breaking any records? No. But the activity is high enough to to be "normal" without having to panic. Most market watchers have focused on the month-to-month net trade statistics (down 10-15% each month), but I've avoided them because I think they're a bit of a red herring. For one, Feb-May numbers are much higher-than-average due to a series of effects all running together; so cooling should be expected. Secondly, I think just talking about total-trade isn't as useful as splitting it up. My analysis chops up the RMT markets (which make up a significant portion of the pie) and let us focus on the pieces. This way we can see how each is moving to color the whole picture. Material trade continues to be a hot market. Those that are active in the game are still getting their content. Also, as I've been saying since the last o7 show, it's an excellent time to be generating cash. 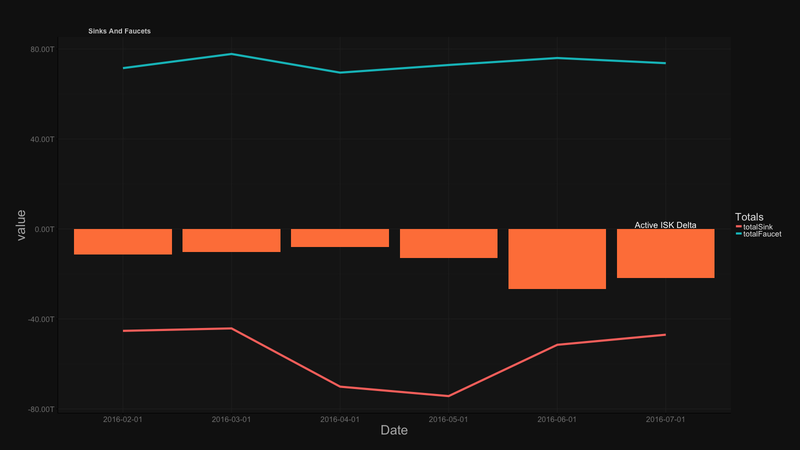 PLEX prices have only just recovered to the 1B mark (thanks to the AT auction). The slump in the ship trade has me worried, but looking at the PVP statistics, it's hard to figure out what exactly is going on with PVP stats staying even while ships traded falls. Lastly, we're still not quite seeing the cash-recovery I was expecting though, so there is still a lot of work left to be done to get back to truly normal levels. It's easy to catastrophize in the summer. Numbers tend to slump most at the end of July, campaigns slow, and CCP's news crawls through July/August due to vacation time. I still believe there's enough on the plate this fall to be excited about, that as long as people don't get too bitter, there will be content to come back to once vacations end. 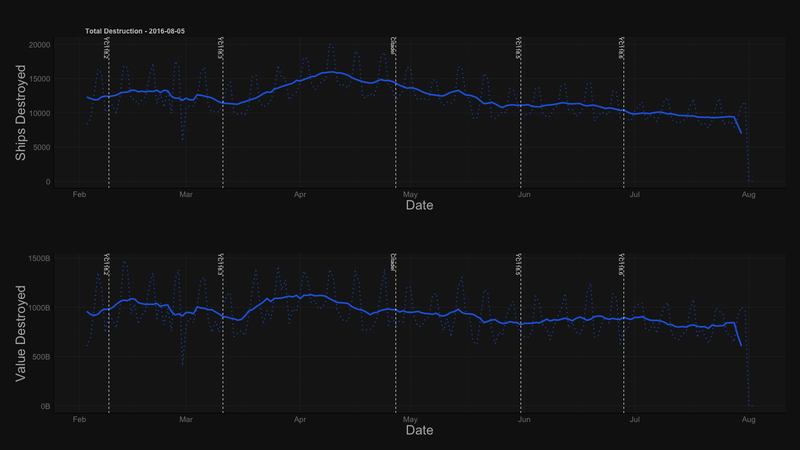 Looking externally, No Man's Sky is probably going to make the August numbers particularly bad. Though, I do expect it to have a positive effect in the longer term, reigniting the hard-scifi spark that only a few games can, and perhaps bringing some contingent back for nostalgia. If I may dip into Blog Banter territory and editorialize: it's a terrible time for picking out trends. With the seasonal ebb and flow is at it's lowest point, drawing a line between June/July numbers would be Fox News grade cherry picking (o/ Sion). Though I personally share a lot of Sugar Kyle's feelings of IRL vs EVE, and have been drifting more and more away from active play into a devfleet/metagame kind of role; like Jonny Pew, I just cannot drop the game entirely. Is EVE going into a new chapter? Absolutely. Dying? 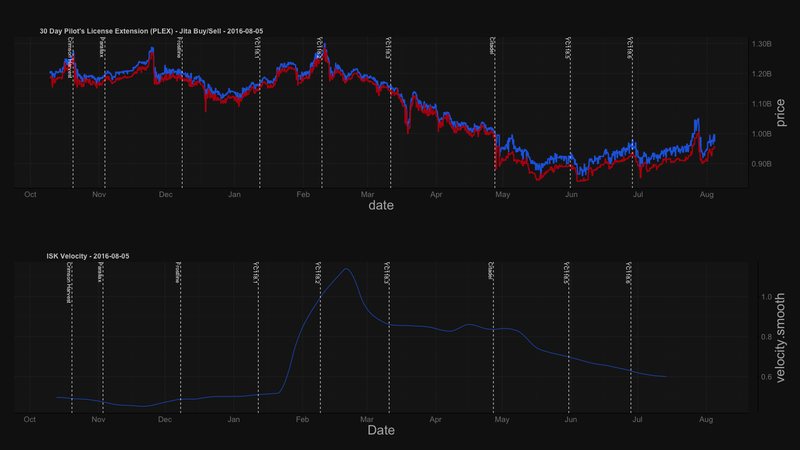 MMO's are dying, but I don't think EVE is doomed yet. When is the hiatus going to end?